Mulford Martin (1763-????) is #254 on my Ahnentafel List, my 5th great-grandfather, who married #255 Betsy Rolfe (1766-????) in about 1789, probably in Perth Amboy, New Jersey. * their daughter, #127 Sarah Martin (1792-1860), who married #126 John Putman (1785-1863) in 1810. * their daughter, #63 Elizabeth Putman (1818-1895) who married #62 Alexander Sovereen (1814-1907), in 1840. * their daughter, #31 Mary Jane Sovereen (1840-1874), who married #30 James Abraham Kemp (1831-1902) in 1861. * their daughter #15 Georgianna Kemp (1868-1952) who married #14 Charles Auble (1849-1916), in 1898. Mulford Martin was born in about 1763, probably in South Amboy, Middlesex County, New Jersey to Thomas and Elizabeth (Ayers) Martin. His father died in 1767, and left a will. In the will, which did not mention his wife, the two sons, Mulford and Thomas, were to be supported from the profits of the estate; which estate they are to have when old enough. Real and personal property were sold in order to support the children. It is not known who became guardians of the children - it may have been a sibling of Thomas Martin or a sibling of Elizabeth Ayers. Mulford married, first, in about 1781 to Rachel Martin, probably a daughter of Joshua and Mary (Runyon) Martin of Woodbridge. 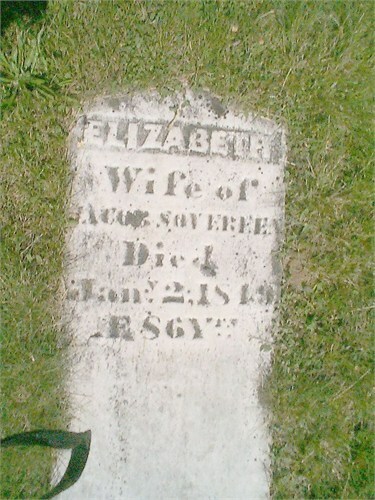 She may have died in 1788, probably without children. Mulford married, second, in about 1789, to Betsy Rolfe, daughter of Ephraim and Sarah (Campbell) Rolfe of Perth Amboy. Mulford and Betsy (Rolfe) Martin had at least six children and perhaps more, probably all born in the Woodbridge, New Jersey area. The book by Frederick G. Rolfe, The Early Rolfe Settlers of New England, provides limited information about the Ephraim and Sarah (Campbell) Rolfe family and the Mulford and Betsy (Rolfe) Martin family. Ephraim and Sarah (Campbell) Rolfe moved to Ulysses, Seneca County, New York in about 1808 and are buried in Tompkins County. It is probable that Mulford and Betsy (Rolfe) Martin went with them because their daughter, Sarah Martin, born in 1792, married John Putman in Seneca County in about 1810, and had their children in nearby Steuben County. Their second son, Martin Mulford Putman was born in 1816 in Steuben County, New York. It is not known when Mulford or Betsy (Rolfe) Martin died - there are no known death, burial or probate records. 1. Frederick G. Rolfe, The Early Rolfe Settlers of New England (Baltimore, Md. : Gateway Press, Inc., 1995), page I-7.9, Mulford Martin family sketch. 2. New Jersey Surrogate's Court, Middlesex County, Wills, Liber I, pages 262-263 (image 104), Thomas Martin will, 1767; "New Jersey, Wills and Probate Records, 1656-1999," digital images, Ancestry.com (http://www.ancestry.com: accessed 7 September 2015, images no longer available); citing original data from New Jersey County, District and Probate Courts.